It’s odd how when you look away your friends seem to go and do some really interesting stuff. I first met Willem Guizeman in 2005 when he was in Birmingham planning some work on the Residents university for the Residents for Regeneration. Then he was fronting a Europe wide organisation which was working with the EU. Last month we saw each other again in The Hague, his home town. Now Willem is doing something much more modest. Because he is close to retirement and doesn’t need to earn big money he and his friend Nol are simply spending time in what they call the Stagehuis Schilderswijk – an apartment they rent on a street corner in a poorer and multi racial area of the city. As well as doing activities, their presence is clearly having other effects. I am currently very focused on side-effects – ones that we measure, but also ones that we don’t think to pay much attention to. It is one of the reasons I am so intent on developing new creative and collaborative methods (see some further discussion on this on Matthew Taylor’s blog), rather than conflict driven ones. Conflict has a negative wake, often fracturing communities regardless of the results. I suggest that Willem’s and Nol’s benign presence is creating bridging social capital and a contagious and soothing balm in this neighbourhood. The position of their building is literally forming a bridge between 2 faiths. Nick Booth described their presence as ‘taking the tensions away’. They are certainly changing how the neighbourhood ‘feels’ – their gentle approach to leadership is having an impact – one that emerges slowly from the connections and relationships that their social space has created. Willem and Nol just plan to be in the neighbourhood. they just want to be there – nothing more. They are not concerned about funding (they are both ok money-wise) so that means they don’t need to be concerned too much about what funders might want. For Willem this is the calm culmination of a career spent working in regeneration and community. They build trust through conversation and being helpful. Their apartment has big windows and a table where people can sit and drink tea together. They take their time and help when people ask for it. The outcomes are very personal. For Willem seeing two young women from different backgrounds laughing together is an outcome – a success. Certainly bigger things ahppen – but he doesn’t bank on them happening. His approach chimes with the one we have learnt to adopt for social media surgeries – encourage people to be patient and have low expectations – high expectations lead to disappointment and a sense of failure. Being patient and taking your time allows people ina community to get used to your work being there. 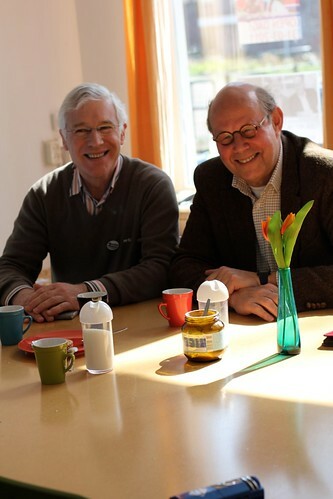 Thanks to Maurice Specht for organising our trip over (we have been many times before) – more stories from Holland to come.